‘Aadarai Mang Aadarai’, the newest movie to begin work sets stage for a modern Romeo-Juliet romance. It is the work of talented young actor Prageeth Ratnayake who had given life to some memorable characters on the mini screen. Prageeth together with promising young actress Chathurika Peries will take on the lead roles of Pavan and Malmee. Other roles are taken up by Robin Fernando, Nadeeka Gunasekara and T. B. Ekanayake. Prageeth had taken on the challenge of scripting, directing and acting the male lead of ‘Aadarai Mang Aadarai’ which is a Romeo’s Eye Picture Production. 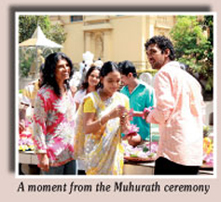 The Muhurath ceremony of the movie unfolded at the Bellanvila Raja Maha Viharaya recently where Prageeth stated that shooting will take place in locations in Colombo. According to him the movie encompasses a touching love story between a guy from a wealthy family and a girl from a middle-class backdrop. Pavan is a law student while Malmee is a kindergarten teacher. Life seems too good to be true once they meet and fall in love but the social strata emerge against them, barring their union. Will the tale have a fairytale ending or have a tragic toll? Prageeth decides to keep us guessing as he urges fans to wit to see the production take to the wide screen. Upali Douglas is the cameraman for the project while Praveen Jayaratne is the editor. Reputed musician Victor Ratnayake will direct the music. Gihan Ranga Bandara is the assistant director, Sampath Perera is the production manager and Janaka Chamara is the art director. Victor Ratnayake and Uresha Ravihari will render their voices to the lyrics penned by Prof. Sunil Ariyaratne, Kularatne Ariyawansha, Kumaradasa Saputhanthri, Wasantha Kumara Kobawaka and Geethanath Kudaligama. The romantic Hindi movie ‘Love Aaj Kal’ will be screened at Liberty Cinema next month starring Saif Ali Khan and Deepika Padukone. With support from Rahul Khanna and Rishi Kapoor, the film is directed by Imtiaz Ali and produced by Saif Ali Khan and Dinesh Vijan. It is said to be a Hindi remake of Taiwanese film ‘Three Times’, directed by Hou Hsiao-Hsien. On the day James Kirk was born, his father passes away on his ship in a last stand against a mysterious alien vessel. He was in search of Ambassador Spock, who is a child on Vulcan at that time, disdained by his neighbours for his half-human form. Twenty years later, Kirk has grown into a young troublemaker inspired by Capt. Christopher Pike to realize his potential in Starfleet even as he annoys his instructors like young Lt. Spock. Check this movie at Majestic Cinema soon! After the events of “Ice Age: The Meltdown”, life begins to change for Manny and his friends: Scrat is still on the hunt to hold onto his beloved acorn, while finding a possible romance in a female sabre-toothed squirrel named Scratte. Manny and Ellie, having since become an item, are expecting a baby, which leaves Manny anxious to ensure that everything is perfect for when his baby arrives. Diego is fed up with being treated like a house-cat. Sid begins to wish for a family of his own, and so steals some dinosaur eggs which leads to Sid ending up in a strange underground world where his herd rescues him. This movie at Liberty Cinema will definitely enthral the cinema-goers. When a meteorite from outer space hits a young California woman named Susan Murphy and turns her into a giant monster, she is taken to a secret government compound where she meets a ragtag group of monsters also rounded up over the years. As a last resort, under the guidance of General W.R.Monger, on a desperate order from The President, the motley crew of Monsters is called into action to combat the aliens and save the world from imminent destruction! Check Majestic Cinema’s latest attraction!